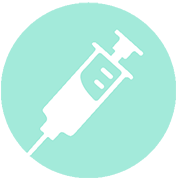 Micronutrient Injection Therapy was designed to deliver high dose vitamins that are difficult to absorb through food or supplementation. The injection is given intramuscularly, completely bypassing the digestive tract, which increases the absorption rate and bio availability. Our shot cocktails were formulated by Shine Doctors to address common symptoms such as fatigue, weight gain, stress and more. You can choose from our list of pre-formulated shots or our staff can educate you on the benefits and help you select the perfect boost for you. Choose from our pre-formulated shots or let our Shine Doctors customize one for you based on your symptoms. * If you would like to more about Vitamin Injections or any other of our services, contact us today. Click here for our Contact form. Located in the Beachwalk Center above Crush Italian Cuisine & Lounge. For wheelchair access, park in the back. Copyright © 2019 Shine Natural Medicine. All rights reserved.